Warren Chiasson is a highly regarded musician in the jazz world who has been called "one of the six top vibraphonists of the last half century" by the New York Times. His own albums include "Quartessence", "Good Vibes for Kurt Weill" (which was selected as a Billboard Pick of the Week), and "Point Counterpoint" with guitarist Chuck Wayne. Chiasson, a self-taught musician, was born in the tiny French Acadian fishing village of Cheticamp, Nova Scotia, and grew up in the rich, joyous culture of Cape Breton folk music. His family moved to the larger town of Sydney and his formal musical training began at age nine with classical violin lessons. By thirteen he was playing sessions with noted Scottish fiddlers of the day, performing at dances, stage shows and radio shows. Later, he played the trombone in high school. 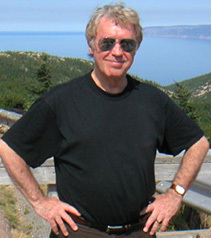 When Chiasson was fifteen, he was profoundly inspired by a George Shearing recording of "I'll Remember April" which led him to study modern jazz. He listened to the records of Shearing, Charlie Parker, Lennie Tristano, and Duke Ellington, practicing late into the night and memorizing their solos on the piano and guitar. But the seeds of his career were not sown until he entered St. Francis Xavier University in Nova Scotia and bought a small xylophone after seeing Lionel Hampton perform in his home town. Once he started practicing this instrument he decided immediately to make music his career somehow. He left college and enlisted as a trombone player in the Royal Canadian Artillery Band, all the while practicing the vibes over eight hours a day. Finally, his jazz studies paid off during a trip to New York, when a chance meeting with a promoter led to a vibraphone audition with The George Shearing Quintet. A week later he was part of the quintet, touring the world and playing opposite the likes of Dave Brubeck and The Modern Jazz Quartet. Since then Chiasson has collaborated with some of the finest musicians in jazz including Paul Bley, Ron Carter, Roland Hanna and the late Jimmy Garrison from the original John Coltrane Quintet. In the late 1960s and early 1970s, the Warren Chiasson/Jimmy Garrison Duo played regularly at Gregory's in New York City, while Chiasson also hosted a weekly jam session at the Signs of the Zodiac in Harlem. Regular guests included Charlie Haden, Lee Konitz, Joe Farrell, Wilbur Ware and Joe Chambers. Today, Chiasson is actively involved in jazz education and continues to travel extensively, performing at concerts and festivals. Recently, at the 20th anniversary of the Atlantic Jazz Festival in Halifax, Nova Scotia, Chiasson was honored for his creative contributions to jazz and for being the first musician from eastern Canada to forge an international jazz career, thereby paving the way for others to follow. The concert was recorded by CBC RADIO for national air play.